Winner of the prestigious James Beard Award, George “Chef Mavro” Mavrothalassitis, showcases contemporary French-Hawaii Regional Cuisine in his casually elegant restaurant. Famous for food & wine pairings, Chef Mavro is the choice for romantic occasions, business entertaining and family gatherings. A native of sunny Provence, this exuberant chef loves to cook and it shows. 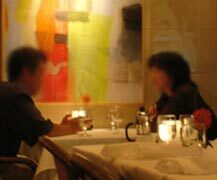 Only five minutes from Waikiki; prix-fixe menus and a la carte dining. The art of food and wine pairing. "Cooking for the love of it." Cooking classes with Chef Mavro. "If you are looking for creature comforts, refined cuisine and fastidious service, Chef Mavro can lay it on." "Where we would dine if we had only one night in Honolulu,"
gave the 'top mark' to our Christmas-night dinner at Chef Mavro."